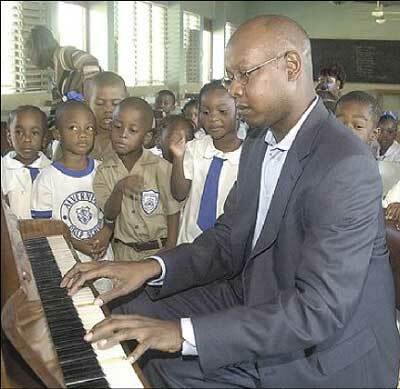 Peter Lawson, senior vice-president of marketing at National Commercial Bank, plays the piano while students of Alvernia Prep School gather around him, recently. Caption: Music through The Heart of a Business Man. Caption: We dont deserve this punishment. Caption: child: "hmmm... nice music, but i think i heard a wrong note there... I'll appreciate the attempt!" Caption: boy in white shirt thinks. "Teacher lie eh. Talk bout seh big musician a come. Whe Bounty or Sizzla deh." Caption: A wah dat im a play. im musse tink seh wi deh a sunday school. Caption:T eacher: Mek mi pass round de collection plate. Caption: Angels learning banking through music. Caption: How him finga dem big so? Caption: A show off mi did a show off when mi tell dem seh mi coulda play piano enu. Thank you for the 67 responses we received. Enter again and we hope you will be the outright winner next time.